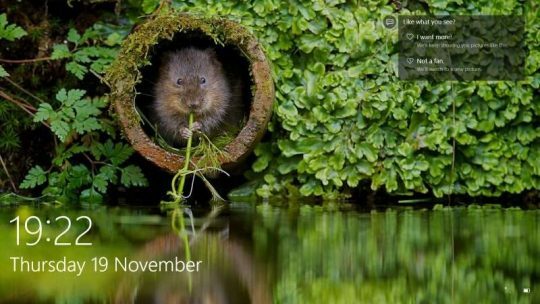 There’s a cool new feature in Windows 10 called Spotlight. Unfortunately, it doesn’t work much of the time. 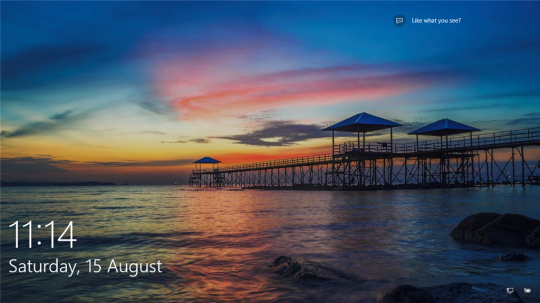 Spotlight is an option for your Lock Screen where Windows will download new wallpapers in the background, and then show you a different purty image each time you go to unlock your puter. It’s a very nifty feature, especially since the images are very nice. But as I said, it doesn’t work at all much of the time. Fortunately, there are two different ways you can fix this problem – without even needing Spotlight to work correctly! Note the little “Like what you see?” link in the upper right corner of the screen. Spotlight lets you vote on whether or not you like the images it downloads. So, theoretically, the quality of Spotlight images will go up over time. Pretty nifty, eh? 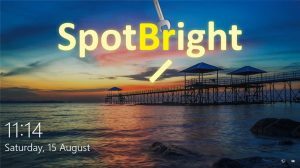 Spotlight doesn’t work – what the heck? Well, that’s annoying! It’s not there. It’s flat out missing! 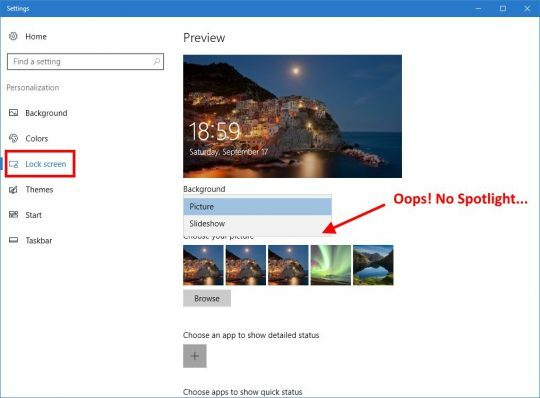 Previously, this was (officially) because Spotlight was not included in the Windows 10 Pro version, but actually that’s horse crap because I did have the feature in an install of Win 10 Pro before more recent updates… There is no apparent rhyme or reason as to why it works for some people, but not others. It’s enabled, but it doesn’t work! Either the downloaded images become corrupted, or something else gets screwed up, and suddenly you end up with either the same image forever, or a blank screen. Sometimes, you get a blue Lock Screen. Roll the dice! Windows 10 N versions? 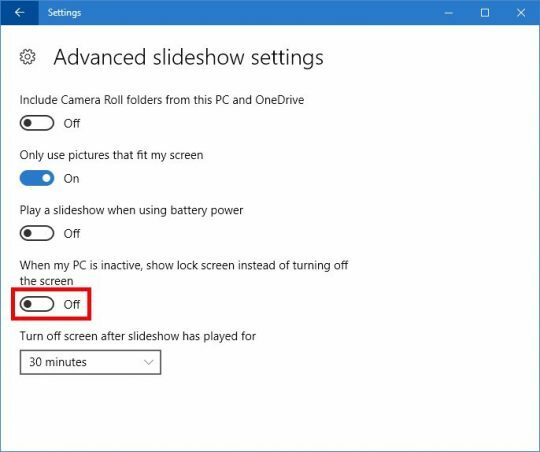 I’m not sure about this, but it appears that if you have Windows 10 N or Windows 10 Pro N (the Euro version without Media Player, etc. ), then Spotlight will also be missing… Either that, or Spotlight simply doesn’t work on 10 N even though it should. Who knows? How do I fix Spotlight? Well, the first thing you might try is to search Google for months as I did… You’ll find lots of solutions, and none of them will actually work. Even Microsoft support is basically useless. I wonder if they actually realize that “Microsoft Support” is an oxymoron? I’ve found two different ways you can get Spotlight working, sort of. Both of these solutions work because they have little to do with Spotlight – which is nice, because it’s broken. Just click here to download 171 Spotlight images from OneDrive. 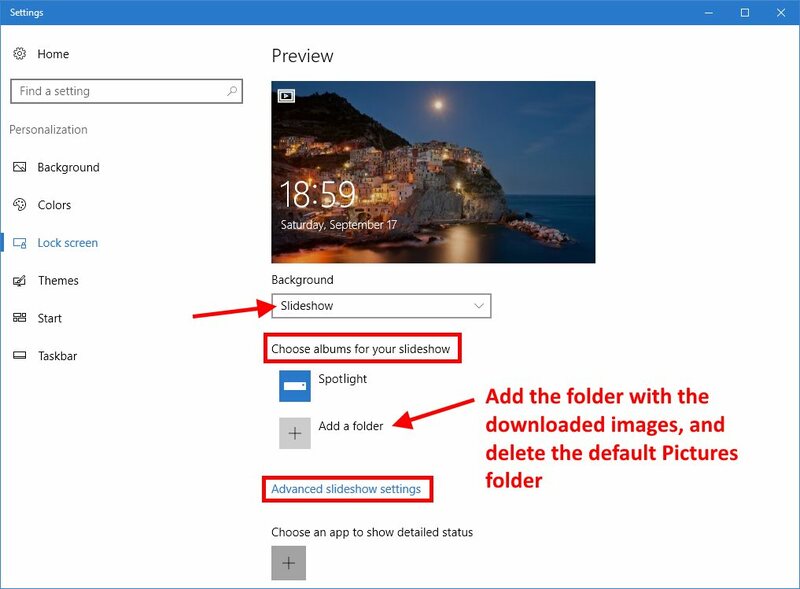 Then, plop them in your Pictures folder, go back to your Lock screen settings, and choose Slide show. Add the folder that contains the downloaded Spotlight images, et voila! Option 1: You can set the advanced options as I have above, in which case your puter’s screen(s) will turn off as usual when you lock the puter. Option 2: Turn the switch in the red box above On. 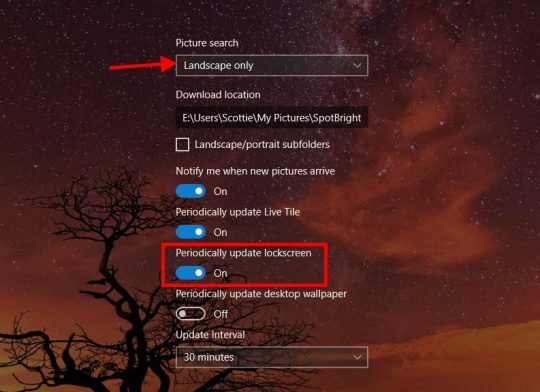 That will make your puter show the Lock Screen with a Slideshow of your downloaded Spotlight images for 30 minutes, and then your puter will go to sleep and turn off the screens. This solution is a bit easier, but it’s not necessarily free. Basically, first you set the Lock screen background above to Picture (instead of Slideshow). Then, you download the Windows app SpotBright. The Search feature actually goes and gets a list of all the latest Windows Spotlight photos. 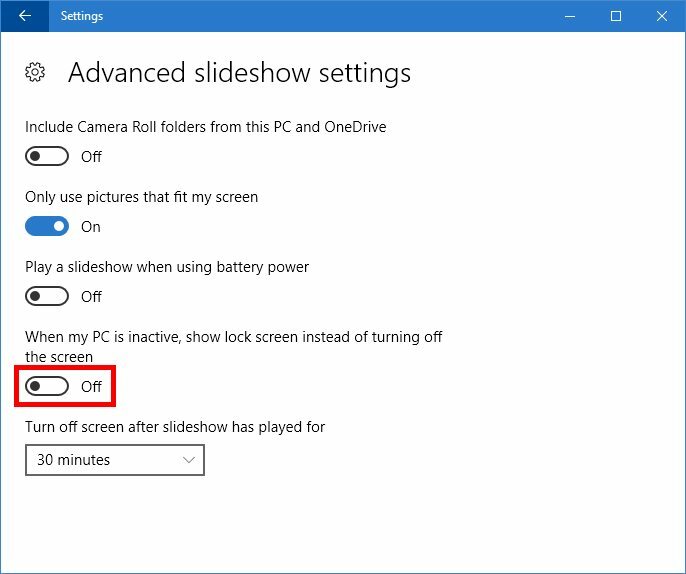 At this point, you can just use the Slideshow feature as described above. 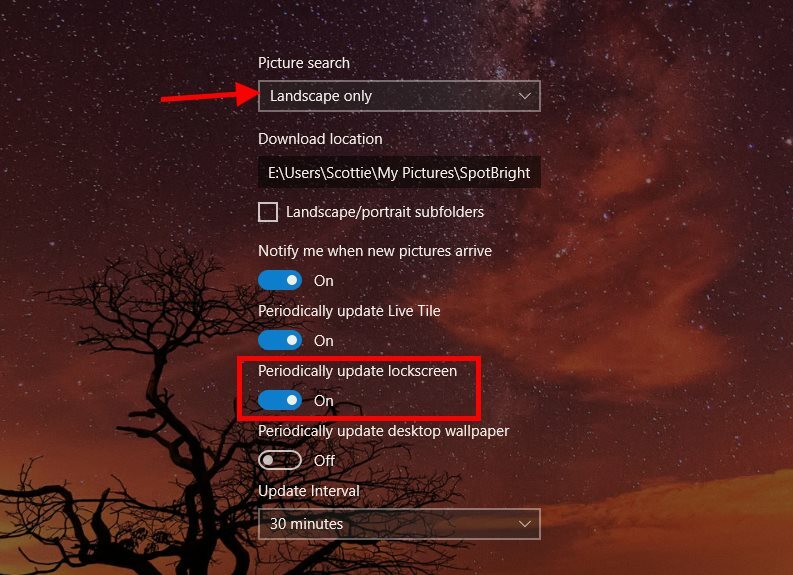 In the paid version, you can also enable the option Periodically update lockscreen. Guess what? This app now makes everything work just like Spotlight – and it does actually work! Each time you lock your puter, you’ll get a new image – without the Slideshow nonsense. BOOYAH! The only thing missing is the ability to vote on the images. Personally, I just bought SpotBright. I got tired of fighting with Microsoft. Not surprisingly, SpotBright found 176 images, so clearly 5 new images have been added since the stash on OneDrive was posted. This way, I paid less than $1 to make the dang thing work like I wanted. And I now I no longer have to be annoyed that M$ can’t fix such a simple (and cool) feature. And neither do you! ← Is Windows 10 gobbling up your bandwidth? 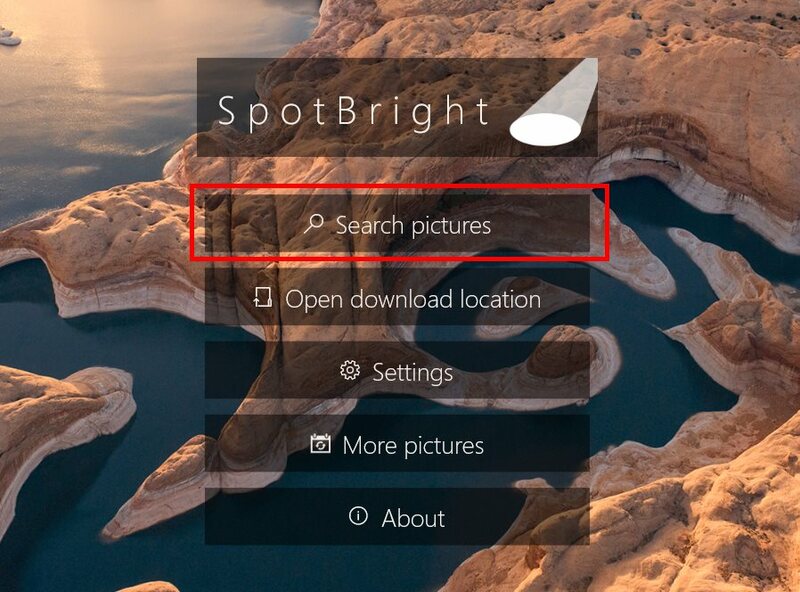 Yes, it seems that Spotbright is no longer able to find any new pictures? I have to take back my comment. It seems that Spotbright could not pull any new pictures from my work, most likely corporate firewall. I tried from home and it immediately found another 125 new photos. It is working well. Aha! I just updated to SpotBright 1.2.5, and it appears that MS changed the location of the images as well as their filenames. So, if you update the app from within the “Store” app on Win 10, it will once again find images to download. I downloaded Spotbright and its not showing the new pics. I must have done something wrong. Help! Do you see a bunch of downloaded images in C:\Users\YOUR_USER_NAME\Pictures\SpotBright? Great solution – was tearing my hair out fixing Spotlight – none of the googled solutions worked. This is working grand – bought it too just for the convenience. You made my Son happy.